We offer our clients with high grade quality certified range of Chemical Receiver, majorly installed in chemical & gas industry, biotechnology and food processing industry. 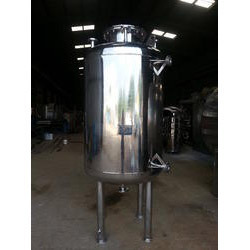 It is widely used for storage of chemicals, solvents and all kinds of fluids. We manufacture these industrial chemical receivers in several standard and customized configurations and shapes.These are manufactured from genuine stainless steel metal and are non reactive to chemicals. Further the steel provides resistance against corrosion. These are developed under the supervision of highly qualified professionals, which make sure that each machine is stringently tested and verified under international parameters. Receivers are used for storage of chemicals, solvents and any type of liquids for chemical, pharmaceutical, biotechnology and food processing industries. Receivers can be fabricated in various customized designs and options such as shape, capacity and material of content. In shape i.e., vertical, horizontal, rectangular and capsule.